Tom Weinberger and Kate Wallich in "Dream Dances"
A few years ago I asked the inimitable Amy O’Neal which young choreographers she had her eye on. O’Neal rattled off a list that included Kate Wallich. It just so happened that Wallich and her dancers, a fledgling group called the YC, were set to perform a short piece as part of that year’s Bumbershoot festival. I went to check it out and was most impressed (in all ways) by the dancers’ unbridled energy. I finally met Wallich in 2014, before the premier of “Super Eagle” at Velocity Dance Center. I was struck by her intelligence and her self-confidence and by her vision for herself and the YC. I was less impressed with the dance, although it did whet my curiosity about where Wallich would take her art. Each of her subsequent works for the YC tantalized with moments of originality, and with the talents of her troupe. But I left each performance dissatisfied, sure that Wallich had more in her. Fast forward to 2017, and “Dream Dances,” which Wallich and the YC performed December 7-10 at On The Boards. 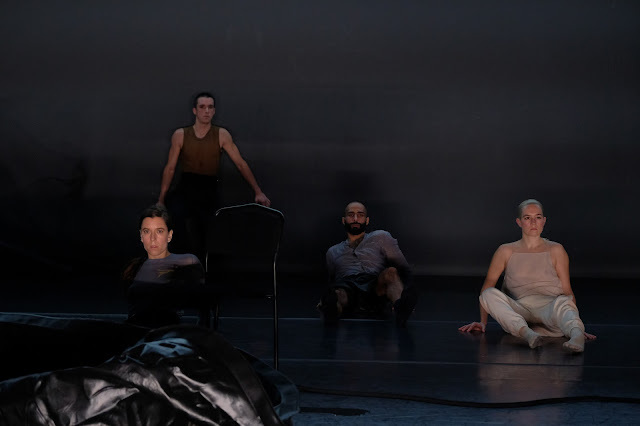 This work for five dancers and two live musicians has been more than a year in development, and it reveals that the promise O’Neal saw in Wallich was not misplaced. “Dream Dances” begins unobtrusively; so unobtrusively that it takes the audience a while to realize the performance has begun. We’re lit by bright white strips overhead, while the stage is left in relative darkness. So we don’t immediately notice the young man lying on his side, gently moving his extended arm across the floor. The other dancers enter, one by one, and lie down as well, taking up his movements. Arms and legs brush across the floor. A leg is bent at the knee, the foot lifted. A dancer arches her back, in yoga’s cobra pose. Another rises into downward dog. 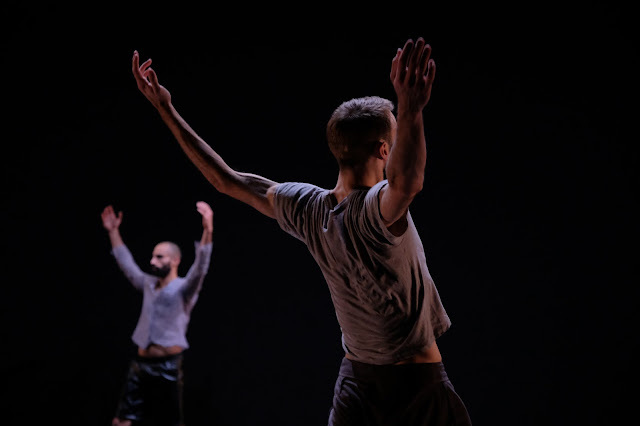 None of these movements is done in unison; it's more like the movements reverberate across the bodies on the stage in a very slow, dreamy, wave. As the dancers rise up to their feet, the music shifts from a gentle drone to a louder throb. The lights over the audience (I hesitate to call these house lights) dim and the stage lights come up. Individual dancers step forward, most notably Wallich’s longtime collaborator Lavinia Vago. This tall, lean woman seems made of rubber rather than skin and bones. Her body bends in every direction with, to me, astounding flexibility and control. She is mesmerizing. But her fellow dancers, David Harvey, Thomas House, Tom Weinberger and Wallich herself, are equally skilled. One signature of Wallich’s work which continues to perplex me is the isolation of her dancers from one another. Even when performing duets, often they don’t look one another in the eye, and rarely do they acknowledge the audience. I’ve often wondered what this says about contemporary America and our increasing reliance on social media and virtual community. This social isolation is again apparent in “Dream Dances,” with two notable exceptions. First, Wallich has created an intimate sexual duet for herself and her newest dancer, Tom Weinberger. And she’s choreographed haunting, extended unison work for the other two men in the YC, Thomas House and David Harvey. These two men move together toward the audience, as a bright white rod of light lowers to bisect the wall behind them. They seem like ghosts, partly because they're dancing in front of the white light and my eyes had a hard time focusing on them. That served to make me concentrate even harder on them, though. Lavinia Vago in "Dream Dances"
“Dream Dances” can be tightened a bit; a section with a spray hose and a misshapen wading pool felt interminable. But this work is Kate Wallich and the YC’s most sophisticated to date. I am partial to movement-driven dance, and this piece delivers that. It also doesn’t wallow in trendiness, or take aim at a meta-message for the audience. 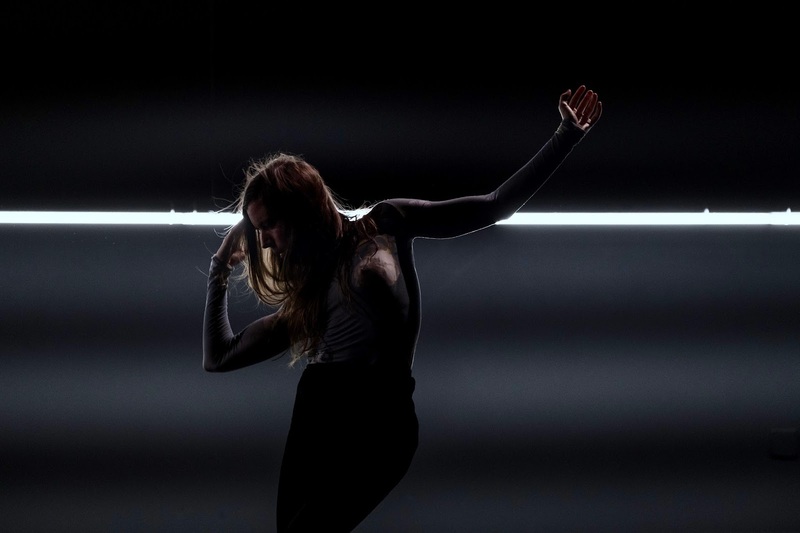 By eschewing those paths, Kate Wallich succeeds in delivering a more nuanced piece of art, one that allows each audience member to to take it on on their own terms.